To enhance the experience of a visit to the Baths, the latter were adjoined by Vauxhall Gardens — park grounds which included a bowling green, archery ground and attractive walks, and where the public could, at times, enjoy “firework displays, monster Montgolfier balloon ascents, grand revolving wheels, dancing on the green and excellent bands”. These gardens lay between the Baths and the Rutland Arms Hotel. The last inn on the west side was the Rutland Arms. To about 1844 this was a small countrified public house. The Rutland Arms Hotel, as it was now called, had for its landlord Mr. Thomas Hives. Born in Ilkeston about 1809 Thomas Hives was the third son of baker and miller John and Dorothy (nee Smith). His father came from Hose in Leicestershire and married his second wife, Dorothy Smith, daughter of Gervas and Elizabeth (nee Chevin) in June 1801 at St. Mary’s Church. The couple then lived at Heanor Common for a short time before moving to Ilkeston in about 1802. Glover’s Directory of 1829 shows baker and victualler John Hives residing at the Jolly Colliers Inn at Ilkeston and the same directory notes that the Speculator coach travels to Nottingham each Wednesday and Saturday, leaving Ilkeston from ‘Mr. Hives’ residence. Pigot’s Directory of 1827-1829 mentions ‘John Hives’ at the Jolly Colliers while his New Commercial Directory of 1828 lists ‘John Hives’ as a baker of Ilkeston while the proprietor of the Colliers’ tavern is ‘William Ives’ – a relation or a mistake? By 1830-31 the name of the Rutland Arms had appeared, its landlord listed by Pigot’s Directory of that year as ‘John Ives’. In Pigot’s Directory of 1835 John Hives is still a baker and flour dealer while Thomas Hives, his son, is landlord at the Rutland Arms. (In fact, John had died in April 1834). Had the Jolly Colliers Inn changed its name to the Rutland Arms between 1829 and 1830, at the same time as the Baths were built? Or had the Hives family moved from one inn to another? The Speculator coach was still journeying to Nottingham, and was leaving from the Rutland Arms – a clue perhaps? – as well as from the King’s Head in the Market Place. John Davies (IDLHS Newsletter July 2001) suggests that perhaps John Hives left the Jolly Colliers inn vacant as he moved to or built the Rutland Arms Hotel nearby — which he might have seen as a better prospect, expecting a flood of visitors to the town now that the new bath houses had been built. Alternatively he may have renamed his old ‘Colliers Inn’, thinking that this name wouldn’t attract the right class of clientele? A make-over was needed? What better than have a name that linked his inn to the Lord of the Manor? Thomas Hives was one of at least six children…..
Born in Heanor, his eldest brother Gervase Smith Hives moved to Newport Pagnell where he married his second wife, Anne Mary Chapman in 1839. He continued to live in that town, for some time being the manager of the Shipley coal wharf there, owned by Alfred Miller Mundy. And then he traded as a coal, corn, lime, timber and seed merchant at the wharf, as well owning a farm. 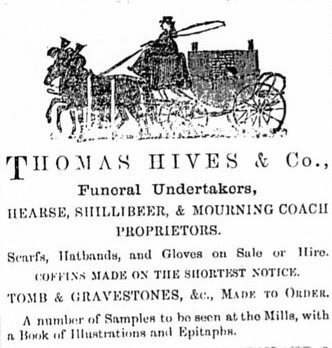 When he died there in 1873 he was head of the firm of Messrs Hives & Sons, coal merchants of Shipley Wharf. Elder sister Elizabeth and brother George died as children. We have met younger sister Mary further up Bath Street with her husband, Charles Chadwick. And the youngest sibling, Ann, married Edwin Riley, butcher and later publican at the Horse and Groom, in 1831 but died in March of the following year, aged 18. 1834 was an eventful year for Thomas Hives. He married at All Saints Church in Kirk Hallam on March 12th 1834. His father John died on April 28th and Thomas became proprietor of the Inn. Younger sister Mary married on July 23rd. And then in September Thomas was robbed of money and several items including a precious silver watch. Three days later 16-year-old Ilkeston lad James Foster was arrested in Nottingham trying to pawn the watch, was tried at Derby Assizes and sentenced to seven years transportation. He spent some time aboard the prison hulk Euryalus at Chatham before his journey to New South Wales on the John Barry from Torbay in September 1835. He arrived at Sydney four months later. John Cartwright recalled that …. “Mr Hives was an active, shrewd man of business, but it is told of him that he once made a slight mistake….He counted up his money into packets of twenty, and on a busy night, in giving a man change for a sovereign, he handed over a packet of gold, on opening which at home, the man hastened back to the hotel, informing the landlord he had made a mistake. “‘Don’t bother me, I’m busy; you should have counted your change before going away!’ was the reply, and we can picture Mr. Hives’ face when he gazed on the golden pieces laid before him”. On June 28th 1849 — to celebrate the anniversary of the Coronation of Queen Victoria –Thomas organised a Grand Gala at the Vauxhall Gardens. A large pavilion was erected where the assembled company took tea at about five o’clock, serenaded by Ilkeston’s Brass Band. Later the patrons enjoyed a dance, when the soul-stirring Quadrille Band performed, interspersed with renditions from the Ilkeston choir. And of course there were fireworks and a balloon ascent, this time by Professor Wilkes of Birmingham and his Victoria Balloon, a facsimile of the Great Nassau Balloon. In May 1850 the now ‘Rutland Arms and Railway Hotel’ was re-opened after “recent extensive alterations and improvements providing accommodation for dinners, tea parties, balls, concerts, with brass and quadrille bands if required”. But be warned! “No person allowed in the Gardens in a state of intoxication”. There were on offer “a variety of novel and interesting amusements, archery, bowling and dancing”. To mark the occasion Mademoiselle Louise calmly risked her life 100 feet in the air, walking a tight-rope, “surrounded by a vivid display of fire works, throwing rockets, bomb shells, and beautiful Bengal lights” — all around her!!! In July 1850 a ‘splendid gala fete’ was organised for the Gardens when Monsieur Tournain “danced on the tight-rope amidst a display of fireworks”. And he was not the only attraction. “The Ethiopean Serenaders, accompanied by a splendid Quadrille Band, with other celebrities, called forth the universal plaudits of a numerous and delighted company”. (NG). Later the same month Mademoiselle Louise was on display again, with more fireworks, a giant balloon, and the grounds illuminated by 3000 additional lights at what was to be the last fete of the season. In 1858, together with his brother-in-law Charles Chadwick, Thomas became embroiled in a financial scandal — a scandal which led in early 1862 to Joseph Shaw, Derby solicitor and high bailiff of the Derby County Court, being charged with issuing forged deeds on property owned by Thomas, in an attempt to raise a substantial amount of money. (Hubert Henri Sugg was Joseph Shaw’s articled clerk from June 1859 until February 1861 when he left the Rotten Row firm before his articles had expired. He then joined the firm of Michael Jessop of Crich and was responsible for the Ilkeston branch of that firm). These forgeries had compromised Thomas’s financial situation such that by 1862 he was appearing at Nottingham Bankruptcy Court, testifying to debts of about £2500 but assets of only about £600. His hotel trade was continuing as was his brewing trade and the timber business which he had begun in 1861 though he did not ‘understand the business’. However the depreciating value of his extensive property, an outlay on machinery and the increasing pressure put on him by a long list of creditors had placed him in some financial difficulty. This is what Thomas claimed during a lengthy examination in Nottingham Bankruptcy Court. By July of 1862 Thomas had paid the composition accepted by his creditors and he received his order of discharge. In the previous March of 1862 Joseph Shaw pleaded guilty at Derby Crown Court to the forgeries and several other offences for which he was sentenced to 15 years’ penal servitude. He served a short time in Derby and Leicester jails before being transported to Fremantle, Western Australia, arriving there in December 1863. He was granted his ticket of leave in 1866, was joined by his wife Maria (nee Cantrell) and two of his three children in 1872 and died at Perth, Western Australia. “Wood and stone steam saw mills, English and Foreign timber and stone merchant, stone carver, and engraver of monuments, tombs, gravestones, tablets, &c., carriage builder, and of the Rutland Arms Railway, family, and commercial hotel, hot, cold, shower and steam baths. Bowling Green and archery grounds, and billiard-room proprietor”. On Friday November 17th 1876 Thomas went out visiting his woodyard business — Erewash Valley Wood and Steam Saw Mills — and returned home about 4pm. He sat down in his breakfast room and died shortly thereafter. He had been suffering from gout for some time and was aged 68. “Mr Hives was one of the most generous hearted men in the town; he was respected by all who knew him; a man who befriended many a person in the hour of need, found many a poor man a day’s work, gave many a meal to a reduced brother, and assisted liberally the various religious bodies in the town and vicinity. “He was a good master, a kind father, and an affectionate husband. “He had been treasurer of the Ilkeston United Order of Oddfellows ever since the establishment of the Order, and assisted in all its departments. “As a landlord and innkeeper his conduct is worthy of praise. He would not allow quarrelling or blasphemy in his house, nor would he wait on parties who showed symptoms of intoxication”. Local poet William Campbell also contributed a poem to the ‘sad departed’. Almost two years after the death of Thomas, the Lodge celebrated its jubilee in July 1878 at the Sir John Warren Inn. The bright and clear morning of the celebration saw a procession of 150 members, some on horseback, around the streets of the town, accompanied by Ilkeston Brass Band. A wagon at the rear, decorated with flags and evergreens, carried the old and infirm members. A service at the parish church was followed by a hearty dinner, after which a short meeting was chaired by Past Provincial Grand Master (PPGM) and Market Place trader John Childs, one of the first members elected in the Ilkeston district. Brother Robert Wood, surgeon of the Market Place, was vice-chair and Brother Edwin Trueman made a short speech. At that time the Lodge had 357 members. The family of Thomas Hives. Thomas’s first wife died leaving him with two daughters. Thomas married Judith Beardsley in March 1834. Their eldest child was Elizabeth Beardsley Hives, who was born in 1836 and who died from encephalitis in November 1848. Daughters Ann (1838) and Ellen the first (1840) both died in childhood. Two further daughters were born – Ellen the second (1842) and Mary Ann (November 1846) — before Judith died in July 1847, aged 42. Ellen, the eldest, married Henry MacDonald, grandson of Henry Carrier, founder of H. Carrier & Sons. Daughter Ellen the second married Henry MacDonald, son of John and Ann (nee Carrier) in April 1860. About 1865 and after the birth of two daughters –Annie Florence ‘Flora’ in 1861 and Frances Ellen in 1863 – the MacDonald family left Nottingham for the United States, eventually to settle in Pennsylvania. In 1873 this article appeared in the Pottsville Daily Mining Journal. – Pottsville being a Pennsylvanian coal mining town. “Harry McDonald, Esq., a worthy citizen of this borough, being about to depart with his family to England, the members of Lincoln Grove, No. 17, U.A.O. of Druids, resolved on presenting him with a handsome P.A. regalia, as a memento or token of their respect and appreciation of his established good character, for his integrity and social qualities, and for his devotion and fidelity to the principles of Druidism. “ It was also resolved as follows: ‘That the members of the Lincoln Grove, No. 47, deeply regret the departure from amongst us of our worthy P.A. Harry McDonald; but the separation or departure from his adopted country being for his pecuniary benefit, we feel resigned to circumstances, and wish for him and his family a safe, pleasant and agreeable voyage over the sea. May they ever be, in their voyage through life, united, prosperous and happy’. “It was further resolved ‘That a copy of these proceedings, certified with the seal of Lincoln Grove, No. 47, be given to brother P.A. Harry McDonald’. “At a meeting of several members of Lincoln Grove, No. 17, U.A. Druids, organised at 9 o’clock p.m. on Saturday last, one of the members, appointed to that duty, in a short and neat speech presented Harry McDonald with the regalia before mentioned. Mr. McDonald responded in a speech of some length. All the other members spoke feelingly on the subject, and with a stave or two of ‘Auld Lang Syne’ the meeting was closed”. “Liverpool. Thursday. October 23rd 1873. Red Star Line Office. Arrived all safe. Will be home tomorrow night. HARRY McDONALD”. Apparently this news caused quite a stir in the town and a steady stream of visitors arrived at the Rutland Hotel anxious to confirm the arrival. The next day, Friday, preparations were made to greet the returning MacDonalds. A flag was unfurled on St. Mary’s tower where the church bells issued ‘merry peals’. In one of his own carriages Thomas and his youngest daughter Mary Ann went to Trent station to meet the returning MacDonald family and all then travelled to Ilkeston via Long Eaton, Stapleford and Trowell. Along the route and as night fell, old friends and acquaintances with torches and lamps were arranged to greet them. And as they came into town the church bells once more burst into life as more spectators lined the crowded streets to catch a glimpse. Also crowded was the Rutland Arms, with friends waiting to welcome Harry and Ellen and their daughters. On the following evening the main ‘welcome-home’ gathering was held at the same venue when the Ilkeston Brass Band, led by Samuel Aldred, honoured the occasion. Shortly after his return — by June 1874 — Henry had become one of the four trustees of the newly-established Erewash Valley Working Men’s Land and Building Society and was voted in as Chairman at the shareholder’s meeting held in that month at the Rutland Arms. Shares in the Society were limited to 600, members paid 1s 3d per week in subscriptions, and its aim was to help them build or purchase their own home. And four months later Henry was marching from that hotel, accompanied by the other members of the Society and headed by the Ilkeston Band, to Crichley Street where he formally laid the foundation stone of the first house to be erected by the Society. It was to be the home of coalminer William Rollinson and his family — according to the Pioneer — although the Telegraph thought collier William Wheatley was to be the occupant. The younger daughter who was at home, was a good pianist. Born in November 1846 Mary Ann was the youngest child and for many years she was ‘at home’. At the Christmas concert of 1874, held at the United Methodist Chapel in South Street, the choir was ably accompanied by Mary Ann, ‘for whose services the choir must be greatly indebted’. Similarly, she very ably presided at the pianoforte for the Ilkeston Brass Band Annual Concert in March 1879. And in the same month she was fulfilling the same role at a concert given by the Trinity School scholars. Ten years after the death of her father, in November 1886 and aged 40, she married civil engineer John Hardman. Mr. Hives second wife was Miss Gelsthorpe, of Nottingham. Thomas married his second wife, Mary Gelstharp or Gelsthorpe, in June 1852. After her husband’s death in 1876 Mary took over the hotel’s licence for a short time before it was transferred to Henry MacDonald in May 1877. However Mary continued to live there as proprietor. In 1884 she retired from the Rutland Hotel. The Marquis of Granby Lodge No 1 of the Ilkeston and Erewash Valley Order of Oddfellows presented her with a leaving gift at the Shipley Boat Inn. For over 50 years the Lodge had held its meetings at the Rutland Hotel and Mary had served as its treasurer. Shortly after this — in April 1884 — she married Draycott market gardener William Baker who was Mary’s brother-in-law before he became her husband. He had married Elizabeth Gelsthorpe, Mary’s sister, in 1847 and she had died in 1882. Mary died at Nottingham in January 1895, by then a widow for the second time and aged 75.